A palace built by Saddam Hussein which was being used as a training centre for so-called Islamic State (IS) has been bombed by UK and coalition forces. The Ministry of Defence said the former dictator's complex in Mosul, north Iraq, was a "major" IS HQ and training centre for foreign recruits. RAF Tornados used guided bombs in what Defence Secretary Michael Fallon called "emphatic" airstrikes on Monday. Mosul, Iraq's second city, has been under IS control since June 2014. The UK is part of a US-led international coalition conducting airstrikes on IS targets in Syria and Iraq. The Ministry of Defence has released details of a series of operations over the past week - including the bombing of a "safe house" for foreign fighters in Iraq, and IS "terrorist strongpoints" close to Syria's border with Turkey. 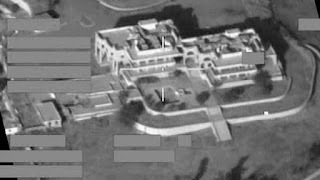 Two Tornado jets dropped the largest guided bombs they use, the Enhanced Paveway III, on Saddam's palace, a statement said. "Extensive surveillance" of the complex, located next to the river Tigris, found the main palace building was being used as accommodation and a meeting venue for foreign IS recruits, while outbuildings were used for training, internal security and "repression", the MoD said. Seven nations were involved in the attack on the complex on Monday afternoon, with initial indications suggesting the mission was successful, it added. Details of the latest air strikes against IS, also known as Daesh, were given as the defence secretary visited the crews involved, who are based at RAF Akrotiri in Cyprus. Mr Fallon said: "Daesh has been losing followers and territory for months, and emphatic strikes like this show that we and the coalition will not waver. "Daesh fighters, both foreign and home-grown, can see that they are targets inside this cult." UK MPs approved UK air strikes in Iraq against IS in September 2014. Mr Fallon said at the time that the parliamentary vote followed a request for help from the UN by the Iraqi government. In December 2015, the UK also launched air strikes targeting IS in Syria after MPs voted for action.